A. Our financial team strictly maintains the confidentiality of their clients. B. Our financial team strictly maintains the confidentiality of its clients. C. Our financial counselors strictly maintain the confidentiality of their clients. Every definite pronoun like it, him, herself, and their takes the place of a noun or pronoun called the antecedent. Every definite pronoun must agree in number (singular or plural) and category. In sentence A, the definite pronoun, their, is plural, but the antecedent, team, is singular. This is a number disagreement. (At least it is in Standard American English; in Standard British English, collective nouns like team, crowd, and committee are treated as plurals.) Sentence B corrects this problem but introduces a subtle number shift and implies (probably incorrectly) that the entire team shares its clients. Sentence C corrects both problems and so is the best choice. D. Sabrina, surprisingly, was the one that broke the silence. E. Sabrina, surprisingly, was the one who broke the silence. F. The filibuster is a strategy where senators can extend debate in order to prevent a vote. G. The filibuster is a strategy in which senators can extend debate in order to prevent a vote. Interrogative pronouns are the pronouns we use to ask questions, like who, what, where, and when. When these pronouns are not used to ask questions, they serve as definite pronouns that refer to the nouns that immediately precede them (that is, they serve as appositives). 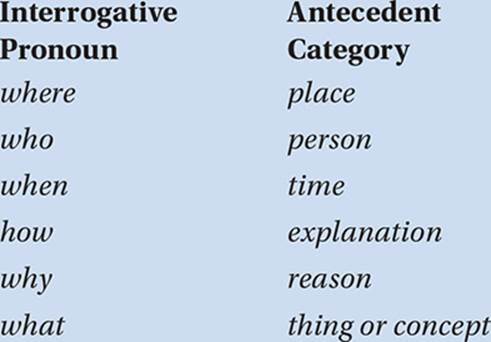 Like all definite pronouns, they must agree in category with their antecedents. The pronouns in sentence D and sentence F both disagree in category with their antecedents: Sabrina is a person, not a thing, so who is a more appropriate pronoun than that. The filibuster is a procedure, not a place, so which is a more appropriate pronoun than where. A. The coach told Mike that he was going to miss the next game. B. The main difference between scientific thinking and ideological thinking is that it gives evidence priority over belief. Both of these sentences are ambiguous. In sentence A, who will miss the game, Mike or the coach? In sentence B, which way of thinking gives evidence priority, scientific thinking or ideological thinking? Both sentences should be revised to eliminate ambiguous pronouns. C. The coach said that he would bench Mike for the next game. D. Scientific thinking, unlike ideological thinking, gives evidence priority over belief. A. My wife and I enjoy attending our school reunions because you meet so many interesting people there. B. My wife and I enjoy attending our school reunions because we meet so many interesting people there. The pronoun references in sentence A are inconsistent: the generic pronoun you conflicts with the personal explanation indicated by the context, so the use of we in sentence B is more appropriate. C. The flying squirrel uses its patagium—a membrane extending from the wrist to the ankle—as a parachute to help them glide safely out of the reach of predators. D. The flying squirrel uses its patagium—a membrane extending from the wrist to the ankle—as a parachute to help it glide safely out of the reach of predators. Sentence C commits a pronoun shift. The pronoun referring to the flying squirrel has shifted from its to them. Sentence D makes the correction. Watch your pronouns to make sure that they don’t shift. Once you choose a pronoun to refer to a particular antecedent, stick with it. Circle all pronouns and rewrite to correct any pronoun errors. 1. This is one of those times in a game where an undisciplined player can lose focus or forget about strategy. 2. If a student wants to learn the meaning of a word, begin by learning its relevant context. 3. Caroline passed the phone to Julia, but she couldn’t bring herself to speak. 4. Not wanting to be the one that slowed the team down, David dropped out of the race. 5. Brown is committed to assisting their students by providing him or her with any necessary financial aid. 6. The media ignored the reports because it didn’t consider them newsworthy. 7. No one that has been through the first week of boot camp ever believes that they will make it through the entire six weeks. 8. Although one should never read carelessly, you should move briskly through the page to maintain focus on the purpose behind the text. 9. Neither Jack nor Ted thought that their team could lose the game, even when he began missing his shots. 10. Students sometimes aren’t ready to handle the extra work that is required when his or her courses become more demanding. 11. I enjoy reading stories where underdogs eventually triumph. 12. Everyone will be expected to do their share to prepare the camp for visitor’s day. 13. The museum received so many donations that they surpassed their fund-raising goal for the year. 14. The judges usually give the trophy to the performer that makes the fewest mistakes. 15. We have configured the pool so that each swimmer will have a lane to themselves. 16. Who was the player that hit the home run? Each of these sentences contains one pronoun error. Can you find it? A. As the waiter was talking to Jenna and I, he showed us the tattoo on his neck. B. I don’t know anyone who can run a campaign more effectively than her. C. Although Carl said he wasn’t hungry, the first one at the buffet was him. D. The team voted and selected myself as the next captain. E. As the waiter was talking to Jenna and me, he showed us the tattoo on his neck. F. I don’t know anyone who can run a campaign more effectively than she can. G. Although Carl said he wasn’t hungry, he was the first one at the buffet. H. The team voted and selected me as the next captain. The case of a pronoun refers to its relationship to the verb. If a pronoun serves as or is equated with the subject of a verb, it takes the subjective case. If it serves as the direct or indirect object of the verb, it takes that objective case. If the object of the verb has the same referent as the subject, then it takes the reflexive case. If it indicates possession, it takes the possessive case. In sentence A, the pronoun I is the object of the prepositional phrase to Jenna and I, and so it requires the objective case, as in sentence E. In sentence B, the comparative phrase more effectively is adverbial, indicating that the comparison is between verbs in the clauses who can run andshe [can run], so the pronoun her should be changed to the subjective case, as in sentence F. In sentence C, the verb was is a linking verb, which means that the pronoun him is being “equated” with the subject one, and therefore should be changed to the subjective case, as in sentence G. (Notice, also, that sentence G “inverts” the main clause from sentence C so that it is parallel with the first clause.) Sentence D abuses the reflexive case, which is the subject of our next lesson. A. Either Caroline or myself will open the account this week. B. Either Caroline or I will open the account this week. e.g., I did it all by myself. She cut herself. • an emphatic appositive (Lesson 13): I myself would never do such a thing. Do NOT use reflexive pronouns as ordinary subjects or objects. Since myself is part of the subject phrase, it must take the subjective case; therefore sentence B is correct. Circle the correct pronoun in each sentence. 1. The climb was much easier for Camille than it was for Jeff and (I/me/myself). 2. The other contestants did not seem as confident as (he/him/himself). 3. (Us/We) detectives are always careful to follow every lead. 4. Every student should make (his or her/their) own study plan. 5. The administrators never seem to listen to the opinions of (us/we) students. 6. Jim gave control of the project to Fiona and (me/myself/I). 7. The university presented the honor to David and (he/him/himself). 8. Justine and (me/I/myself) have always been closest friends. 9. There is no point in (our/us) delaying the tests any longer. 10. It seems quite clear that you and (I/me) will have to work together to solve this problem. 11. It might be difficult for (him and me/he and I) to agree on a topic. 12. (We/Us) and the other new members debated the issue for over two hours. 13. The owners of the club offered my wife and (I/me/myself) a free bottle of wine with dinner. 14. No other member of the team could outrun (I/me/myself). 15. The teachers were getting tired of (him/his) constantly falling asleep in class. 16. Major League ballparks have always held a special attraction for Dave and (I/me). 17. I am concerned about (you/your) taking so much time off work.